For all ordinary work No. 12 gage wire nails are recommended. Figs. 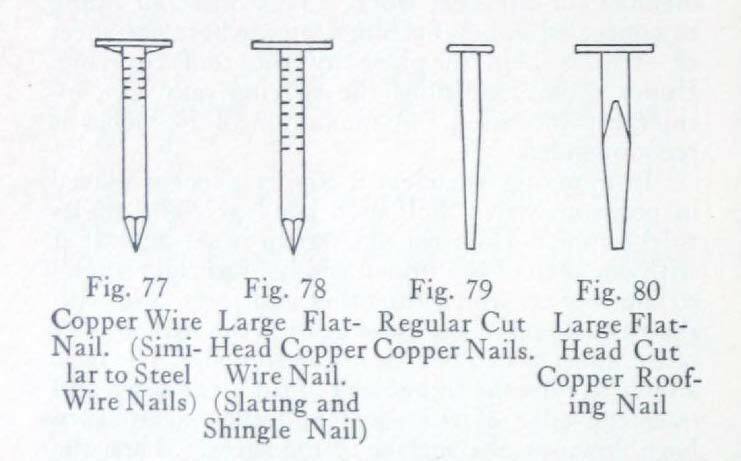 79 and 80 show cut nails of copper such as are regularly used for roofing. The disadvantages of these can be readily seen. The shank tears the sheet and the head, if driven home, makes a further tear, so that the sheet is badly cracked about the nail-hole. In exposed positions where wide flashings or gutter-linings are subject to violent wind storms, or in factories or mills where the wood sheathing is likely to dry out quickly because of heat from the interior of the building, heavy (10 gage) wire nails, with barbs cut in them the full length of the shank are recommended to hold the copper securely in place. Such nails can be furnished quickly by jobbers or manufacturers. They carry an extra of approximately ½ cent a pound over the usual list on kegs of 100 pounds. Smaller quantities are furnished by arrangement only. 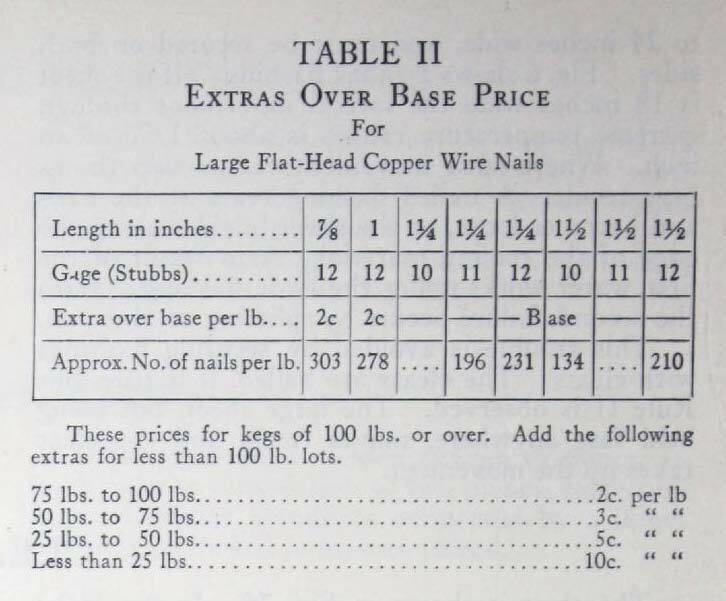 Table II shows the sizes and list prices of copper nails suitable for flashings. [Note difference in head of ordinary wire nail (Fig. 77) and large flat-head wire nail (Fig. 78)]. Brass nails are also used where a non-corroding fastening is needed. They are particularly adapted for slate and tile roofs where large cut nails are necessary. They are somewhat cheaper and harder than are copper nails of the same kind. Fig. 81 illustrates copper and brass tacks such as are used for fastening canvas decks, etc. The edges of sheets to be soldered must be carefully tinned wide enough for proper soldering. New block tin should be used and, if possible, the sheets should be dipped in the molten tin in the shop rather than tinned with a soldering-copper on the job. The flux used should be the same as that used for soldering. For tinning on the roof heavy coppers are essential for satisfactory results. Tinning can be done at the rolling mills. Where it is possible to estimate in advance the amount of tinning necessary it is often advantageous to have the work so done. It insures good results and an even distribution of tin. It is difficult to determine in advance the quantity of tinned sheet necessary for a job, and there is, accordingly, the uncertainty of ordering too much or too little. The use of killed acid as a flux is universal and, in the majority of cases, successful. Nevertheless, its use should be avoided as the chances of injury to the sheets are great. Acid flux of an improper kind will do irreparable damage to the finest workmanship.